Winter has arrived here in northeast Ohio. It came with a vengeance! We had this quick first snow, followed two days later with eighteen inches more. I dug us out. Last night, it drizzled for four or five hours. We had a slushy mess today. Six to eight inches covers the ground, but slush and mud are underneath. Ugh, that is winter, but not my favorite kind of weather. The cattle and sheep took it all in stride. They waited out the rain in their respective sheds. The horses went out to play during the deep snow event. They had a great time. Today, they romped and splashed about like children. Tonight, they are back in the warm barn, coats all brushed and ready for bed. The winter chores are mostly about feeding and making sure all the animals have a dry, warm bed. That means shoveling lots of manure. The manure makes compost so as I wheel each load to the pile, I smile a bit knowing the payback comes in the spring. Those rich nutrients make my crops grow well and round out a well managed farm plan. So as the snow piles up and the rest of us hunker down, I will pile up the benefits…one forkful at a time. 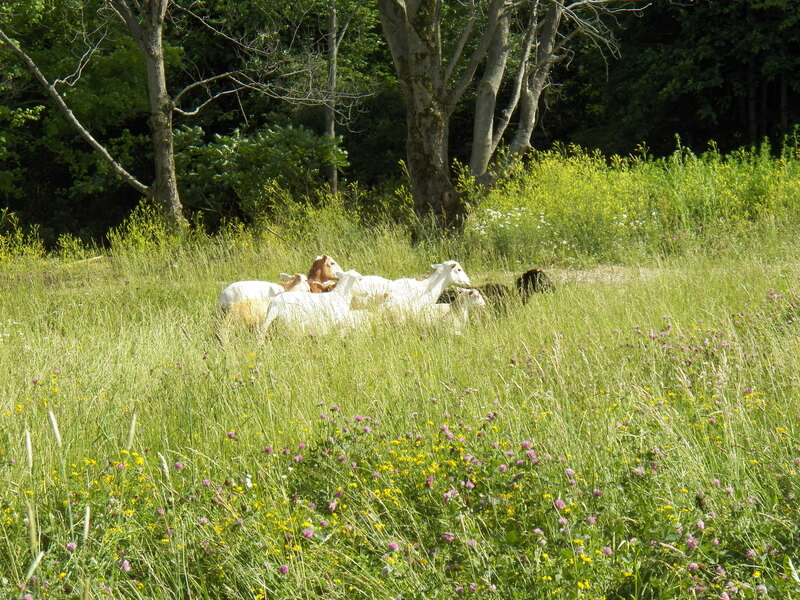 4-legged mowers back on the pastures! I just couldn’t stand spring time pastures without spring lambs I guess. No really it all came to me a few days ago. It makes no sense to have to mow the pasture around the back pond and sugarhouse. I have worked a long time to get good forage to grow there. I don’t want the cows or horses punching holes all around the pond edge. Trimming there is simply a sheep job. The grass turns small lambs into tasty meat by summers end. The place looks neat and trimmed to boot! These ewes are from my old flock. I didn’t have to be too particular for I just want the mowing job done. I have my old black nemesis “Midnight” back. She and I have exchanged many looks and one-sided cuss sessions. I swear a lot and she just eggs me on with a baa-baa, raspberry sound 😮 I also got a couple ewes who only had one baby this year. Lastly, one ewe is here because she had a “bad personality”, what ever that means? They are not too friendly yet. They managed to hang out long enough by the door to the sugarhouse last night to leave me a landmine…which I of course stepped in first thing. They watched from a nearby hillside with big grins on their faces. I shook my shoe to no avail. The manure made from clover blossoms and orchardgrass apparently has the same bonding ingredient as super glue. I did get it off after a trip through the mud to a nearby stream. Thanks to the sheep I walked in a wet shoe most of the morning! Ahhh yes…and it was my idea! I spent last weekend, before the current rainy weather, spreading all of our manure. The manure has been piled and rotting since last fall. I don’t like to spread raw manure. I feel that I lose too much when doing that. The manure, composted or even partially composted, is much better for the soil and the soon to be growing plants. The nutrients are more readily available to the plants after it has been composted. 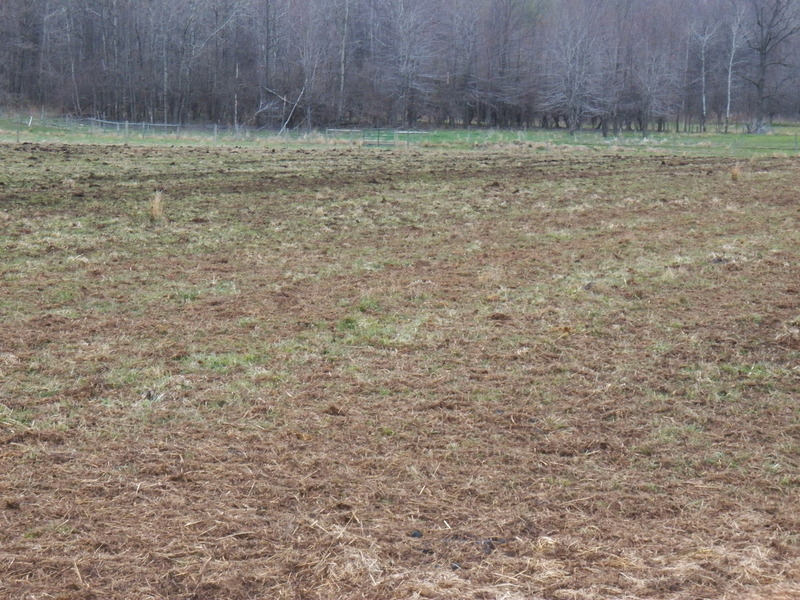 I also leave room at the end of the field for a grassy strip to absorb any runoff that might escape the field. I believe that environmental stewardship is the responsibility of every farmer or landowner. I try to practice what I preach and farm by example. I got to share my experiences and my efforts with some kids today from our local technical school. It was a great day!